One of the first public wave energy testing systems in the United States began operation this week off the Oregon coast near Newport, and will allow private industry or academic researchers to test new technology that may help advance this promising form of sustainable energy. Ocean Sentinel is a $1.5 million device developed by the Northwest National Marine Renewable Energy Center, or NNMREC, at Oregon State University. 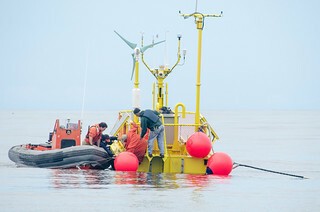 The device was towed to the Center’s designated testing site 2 miles offshore from Yaquina Head on Sunday by OSU’s R/V Pacific Storm, and attached to a battery of mooring anchors that will keep it in place. It’s a major step forward for the future of wave energy, and should do its first testing within days, when the “WetNZ” device developed by private industry joins it at the testing site. The creation of this mobile wave energy test facility has been needed for years, experts say, and it will be used by many companies and academic researchers in the quest to develop wave energy technology, measure and understand the wave resource, and study the energy output and other important issues.